INCIDENT ADDRESS: 3402 E Garnet Ave. PROBABLE CAUSE: Mechanical failure of the propane tank or the tubing carrying the propane from the tank to the barbecue. DAMAGE EXTENT: The rear deck and its roof, the kitchen/dining area inside the home. Smoke damage throughout the interior of the house. Fire Department section starts on PDF 8, page 7. 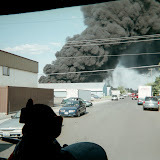 NARRATIVE: This morning, January 15th 2006, at 0400 hours, the Spokane Fire Department received a 911 call for a fire in a home located at 347 W. Central Ave. 23 Fire Fighters responded on 6 apparatus to fight this fire. Arriving crews found a single family residence with fire inside the attic and front living room. The first arriving Officer from St13 made sure that everyone was out of the home and her crew attacked the fire. This fire was brought under control within minutes. The fire consumed portions of the attic and front living room. Smoke damage occurred throughout the home. Fire Fighters were on the scene for about 2 hours digging out the remainder of the fire. There were no injuries at this incident. The family and their pets should be back in their home in a relatively short amount of time. PROBABLE CAUSE: Preliminary evidence at this incident suggests the fire was caused by the electrical wiring in the attic. The official pronouncement will be made by investigators after all fire evidence has been reviewed. DAMAGE EXTENT: Fire damaged the attic and front living room areas of the home.